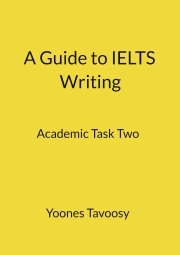 Description of "A Guide to IELTS Task Two"
Yoones Tavoosy graduated from the University of Isfahan. He studies English Language and literature. He has been teaching the English Language for 11 years in different Language Centers in many cities of Iran. He also is an IELTS and TOEFL instructor, besides he, at the present, serves as a director of Foreign Languages Department at Tehran Institute of Technology. He published several articles on teaching, literature, social studies in Spain, the United States, France, Germany, England, etc. Furthermore, he is the author of two books: “A Road to Academic Writing” and “A Handbook of IELTS Writing” in LAP LAMBART ,and LULU Publication in the USA . Reviews of "A Guide to IELTS Task Two"